Mykonos is one of the most famous islands in Europe, with a vivid nightlife, great beach life and beautiful scenery to enjoy. Here is a list of the top 10 things to do in Mykonos for three days. You can also get our Mykonos in 3 Days Travel Guide here. 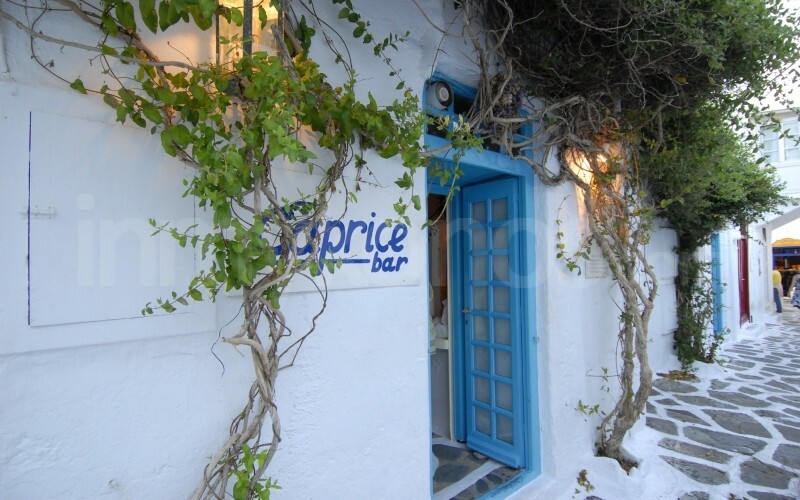 #1 Visit Caprice Bar: A must see in Mykonos, since 30 years ago! Caprice bar is certainly the most famous bar of Mykonos. 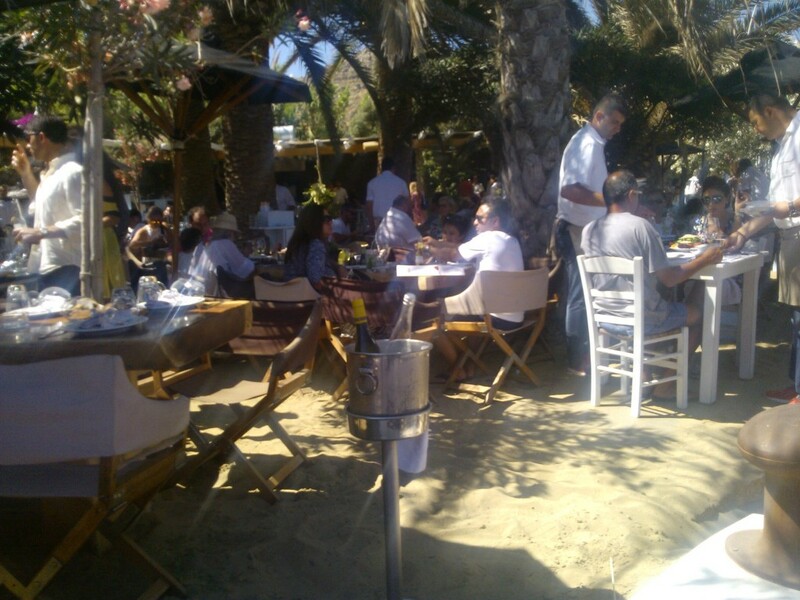 It is located on the sea, and you can enjoy great margaritas, happy people and great music, almost all time of the day. 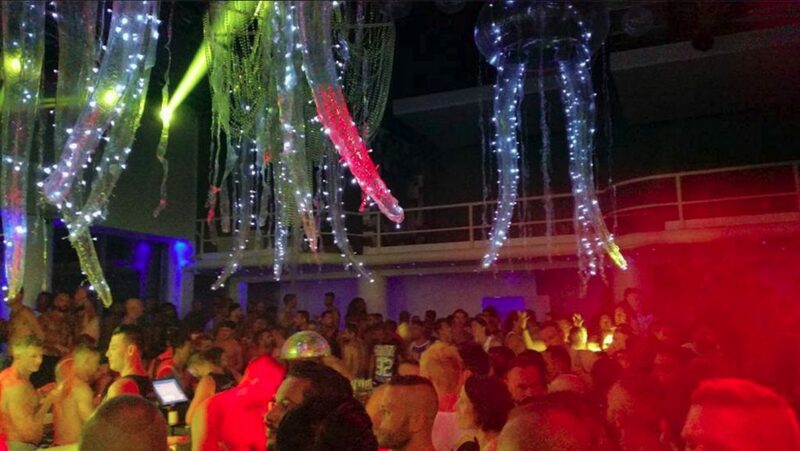 It hosts many great parties in the night, so don’t forget to visit it at least once while you stay at Mykonos. The facts about Mykonos, say that this island was home to only a few poor inhabitants 40 years ago. Fishers mainly and people raising goats and doing an occasional little commerce with the mainland of Greece. 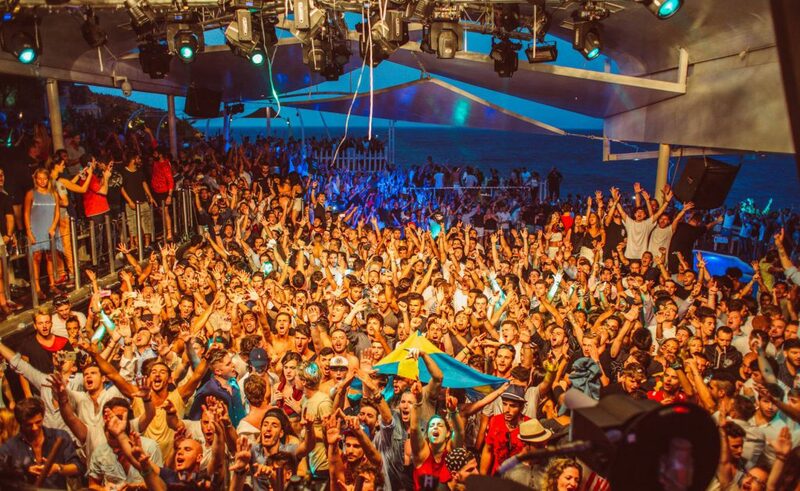 All of this changes once Mykonos started to become mainstream in the global jet set groups. And Caprice was their first choice for a meeting in the night. A lot of crazy nights have taken place here. In 2016, Caprice of Mykonos Bar has moved just a few steps next to its initial position, always on the Little Venice seafront with the stunning Mykonos Sunset views. A true legend, praised by the international press, not only for top quality service but also for the unique party atmosphere, Caprice – one of the best bars worldwide -is always cherished by celebrities, the favorite haunt of showbiz stars, artists, and jet-setters of all times. Just ask anyone to find your way there. Below you can see the most sought-after tables in Caprice, with an excellent view to the Little Venice of Mykonos. The best time to go to Caprice would be either in the morning for a coffee (try Freddo Espresso or Freddo Cappuccino coffee), or in the evening, after 23:00 pm. 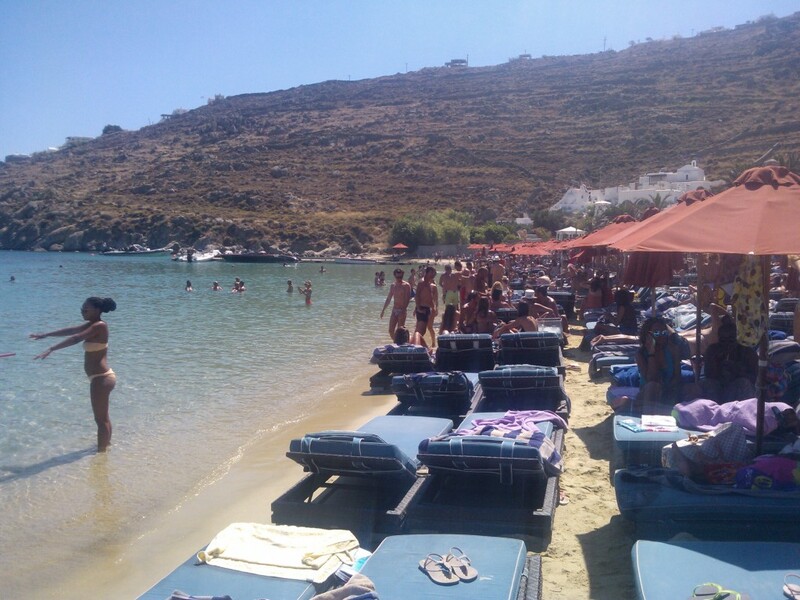 Paraga beach is some km far from the main town of Mykonos and offers a fantastic beach, together with a beach bar that attracts a lot of young people having fun after 5 PM. Go early in the morning, at around 10:00 am and get your umbrella and sun bed. They cost around 30E for a set, but they will save your day. You can also order drinks and coffees from the beach bar that is on the beach of Paraga. Some tips regarding Paraga beach: In the middle of the Paraga Beach there is a beach bar which is called “Kahlua Beach Bar.” Kahlua Bar is one of the two most “posh” beach bars in Mykonos, together with the beach bar of Nammos restaurant in Psarou Beach, so you will find out that many famous customers have already booked many umbrella sets. There is also a kind of “face control” in this beach bar; if you are alone and look too poor, the “umbrella-sets manager” may give you this polite answer: “Unfortunately everything is booked right now – the visitors will come later; I am afraid I cannot give you an umbrella set”. It is also quite expensive to get an umbrella set in Kahlua Bar. It costs 30 euros for two sunbeds and one umbrella. You get to use two towels, and the sunbeds are luxurious, but still, it’s pricey. Next to Kahlua bar and on the beach, there is another shop that rents umbrella sets; here the umbrella set cost for two is 25 Euros if you are in the first line, just in front of the sea. And 20 euros if you want to choose an umbrella set towards the back (3d-4th line). The Freddo Espresso coffee costs 4.5 Euros, so for two persons, you will pay a total of 25E + 9E= 34 Euros for an umbrella set and two coffees. The water costs 1.5Euro for a big 1-litre bottle of water. No matter where you will get your umbrella set from, you will listen to music from Kahlua beach bar. It plays lounge music until 17:00 o’clock and then it starts playing party music for 3-4 hours. Usually, it hosts great parties, especially in August and there is a lot of fun in the afternoon. So, Paraga beach offers you a great experience from 10:00 am until 21:00. 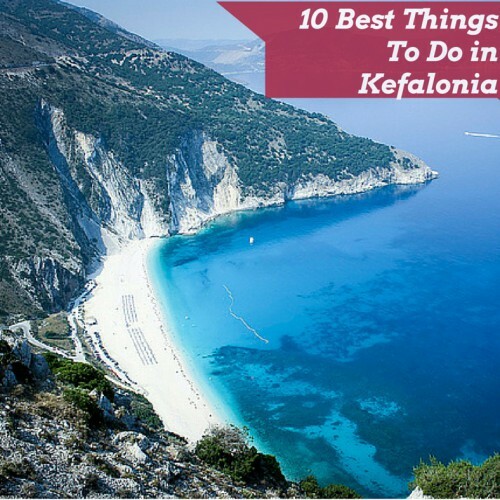 You can get here in the morning, grab an umbrella set, drink some cold coffee and bears, have lunch at a taverna on the beach, or in Kahlua bar and then party at Kahlua bar until 21:00. After that, you can get back to Mykonos town, get some rest and continue with a walk to the Mykonos town (Matogiania area) and whatever the night brings on. 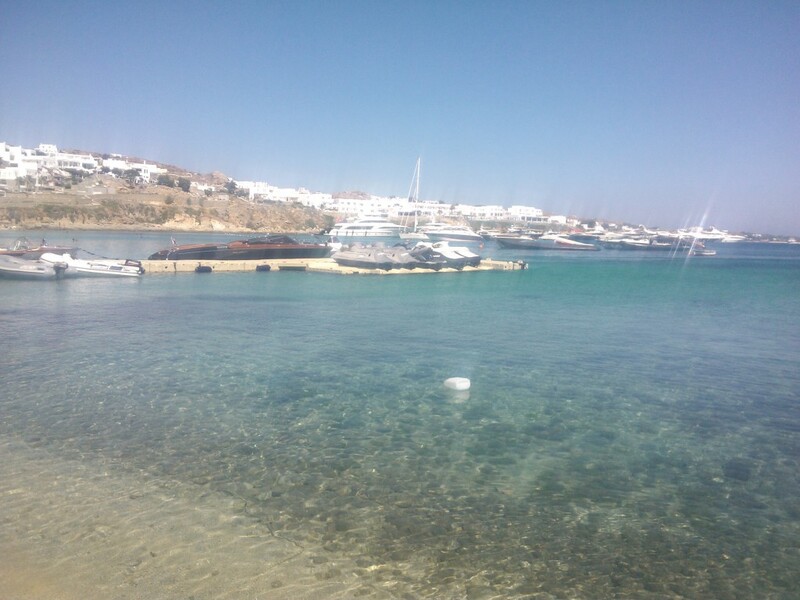 Here is also a view of the main beaches of Mykonos: Platis Gialos Beach, Psarou Beach, Paradise and Super Paradise Beach, Panormos Beach, Elia Beach and Agios Stefanos beach, are the most famous ones. 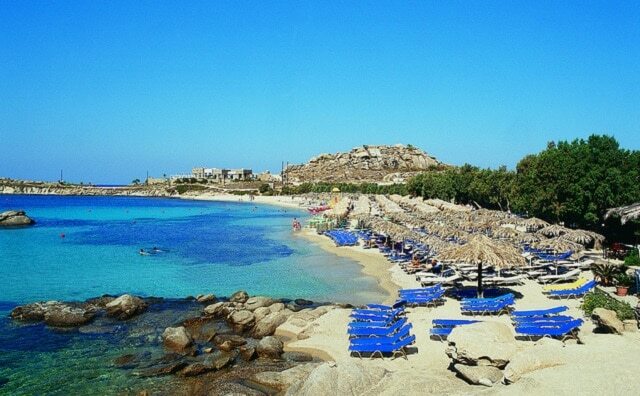 A huge beach with white sand and great water, although a little bit far from the main town of Mykonos. It has a beach bar which holds some of the best parties on the island every day. Super Paradise Beach, is supposed to be the “Craziest Beach” on the island, together with the Paradise Beach, where “Tropicana” bar exists. 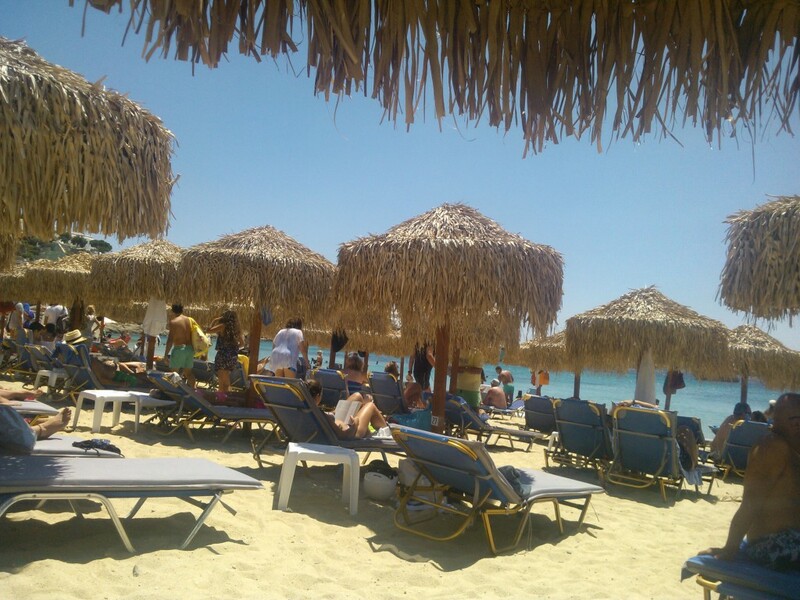 Be careful; there are two beaches with similar names in Mykonos: There is the Paradise beach, with the “Tropicana” beach bar and there is the Super Paradise Beach, with its beach bars. Super Paradise beach has also a place where you can get some food and have a quick lunch. 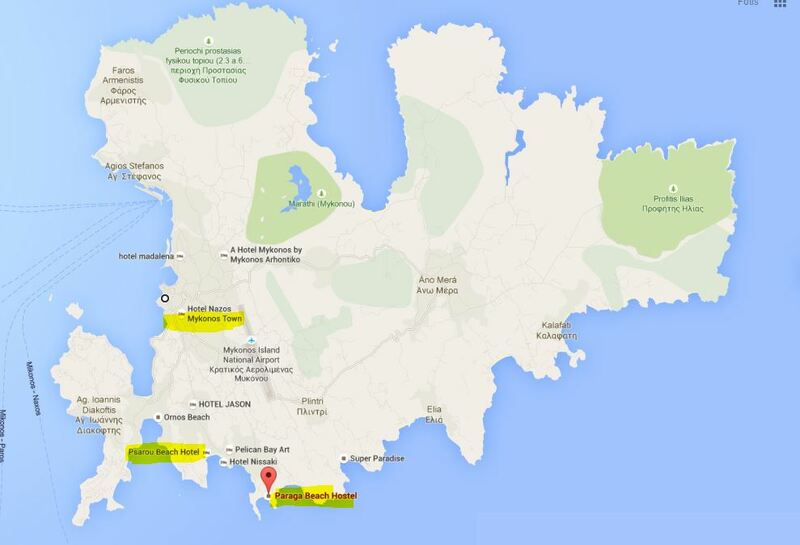 The Super Paradise beach is not a posh place like Psarou beach or Paraga beach. Super Paradise is a beach where everything can happen, so be prepared to see funny, crazy things happen; People are dancing on the bars, people wearing strange clothes, getting drunk, a lot of flirting, etc. You can, of course, enjoy the beach without mingling with the crowd if you go towards the east side of the beach, where the music is less loud, and there are no beach bars. 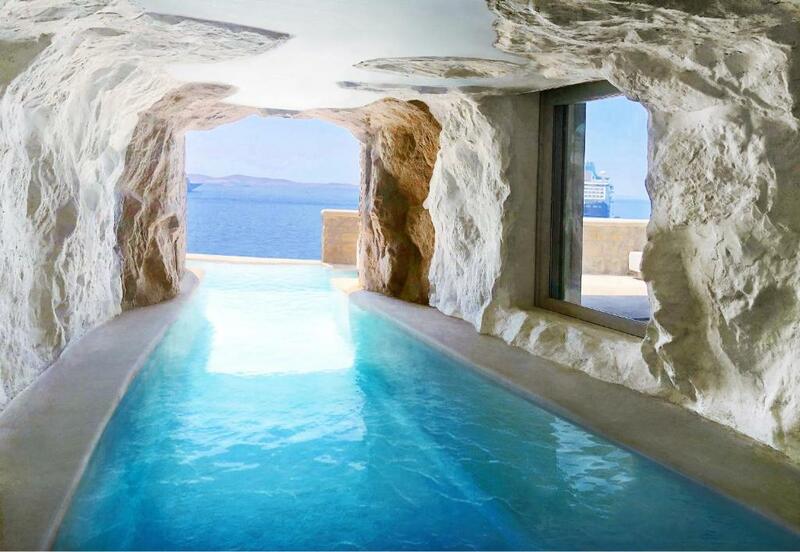 If you go to Mykonos for the first time, you should pay a visit to Super Paradise, even just for the experience. Have a look at https://www.facebook.com/superparadisebeachmykonos to get the feeling. #4 Have a walk in Matoyiannia – the old town or “Chora of Mykonos.”. One of the main Mykonos attractions. The old town of Mykonos is full of small white houses and romantic streets with fabulous flowers, while it hosts several bars and restaurants. You will find yourself strolling around for many hours in this magnificent area. The beach of Kalo Livadi is not that well-known, and usually, locals go there. It has a fantastic beach and a great beach bar. It is better for lounging, relaxing and enjoying a quiet day on the beach. One of the best restaurants in Mykonos where you can taste some great food including spaghetti with seafood, lobsters, shrimps and amazing Greek fish. Kiki’s restaurant is a tiny restaurant in Agios Sostis Village in Mykonos. Unfortunately, you cannot reserve before going there, so you will usually find people expecting to grab a table. There are usually up to 20 people waiting in the line to catch a table, so you will most probably have to wait for 15 to 30 minutes. Fortunately, the owner will treat you with rose wine and water, and you will be waiting in a beautiful place, without exposure to the sun and with a great look on the small non-touristic beach of Agios Sostis, so it is quite an enjoyable time to spend. Kiki’s restaurant/taverna is open until 19:00 in the evening. Last time we were there, most people got the huge pork chop, which costs 17Euros but is enough to cover your hunger. The prices are around 25 euros per person if you get the main course, two small dishes and a couple of beers. 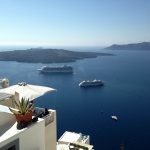 It is not cheap, but as you will quickly find out, there are almost no cheap places to eat well in Mykonos, as opposed to most of the Greek islands. 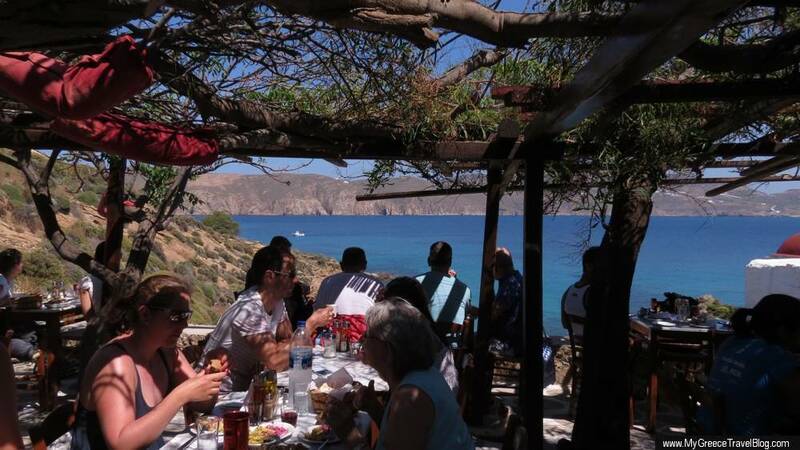 A nice combination would be to go to Panormos beach for swimming – or to Agios Sostis beach – and then go to Kiki’s restaurant for your dinner, around 16:30. 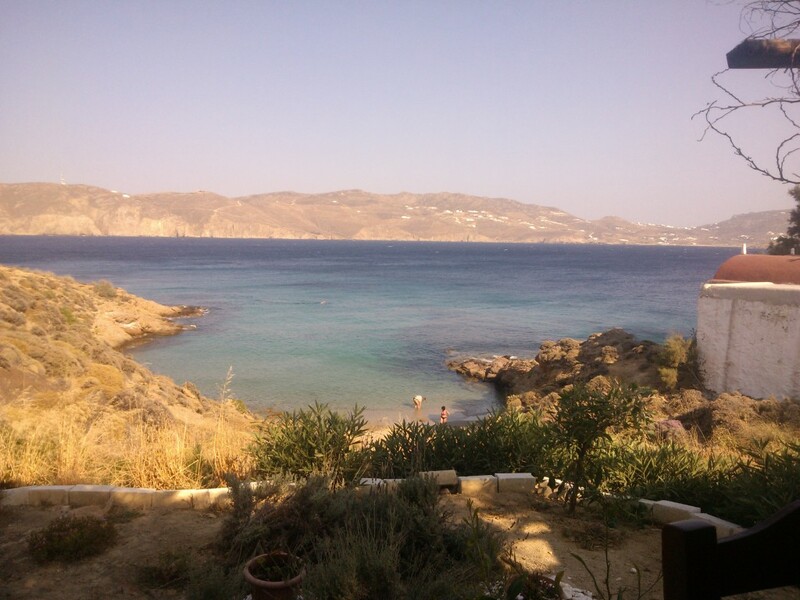 Agios Sostis beach is 200 meters from the restaurant and Panormos is 2 Kms away. Agios Sostis beach does not have any umbrellas or beach bars, so you should bring your protection, as the sun is intense on this sandy beach. 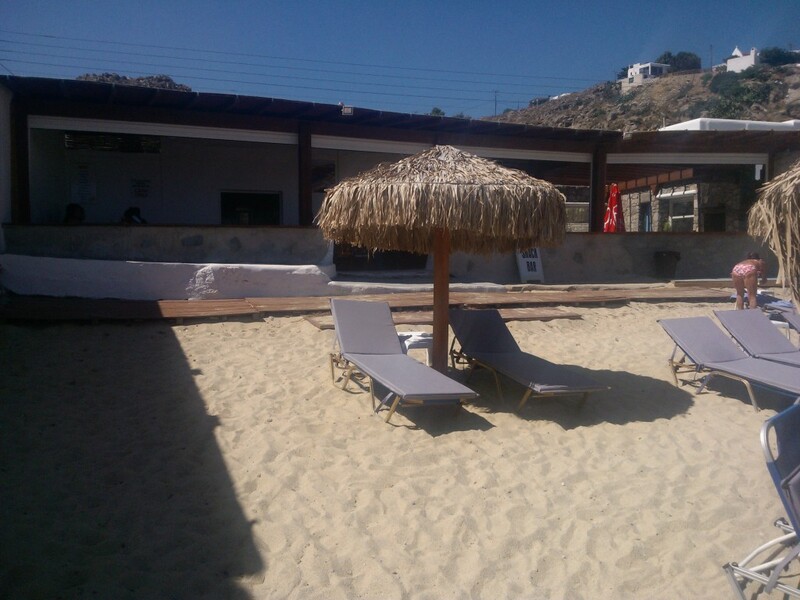 Panormos beach has an excellent beach bar and umbrella sets. 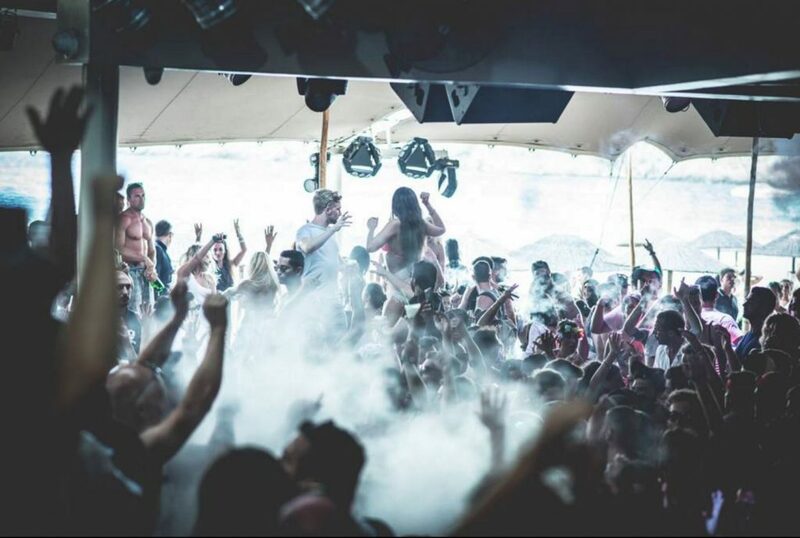 Cavo Paradiso is 10 km away from the town of Mykonos and is one of the top 3 summer clubs of Europe, together with the ones situated at Ibiza. Tiesto and other world-class DJ’s host parties there. Go there after 01:00 AM and stay there until the morning to enjoy the sun coming out while eating breakfast, after a great all-night party. We warn you that this is mostly a place for people at their 20’s (or older guys like us who still feel young and wild!). 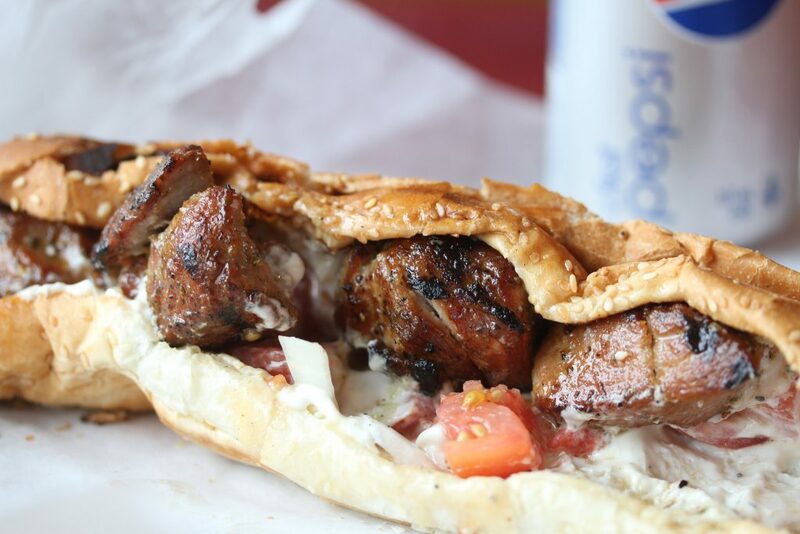 Souvlaki is the most popular street food of Greece, and everyone enjoys eating it. 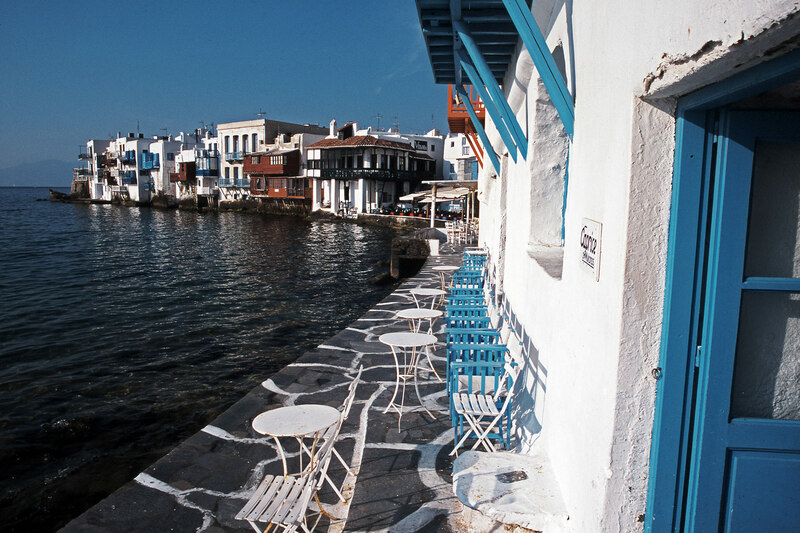 You can try it at several spots in the old town of Mykonos. Ask for “tzatziki” to be included in your “pita” with “souvlaki.” Tzatziki is a famous Greek yogurt sauce with garlic and cucumber that you will love forever! Psarou beach is the place to see and be seen with all the wealthy visitors of the island going there. Quite expensive, though. Go early in the morning, find a beautiful spot and treat yourself in the noon at Nammos restaurant which lies on the beach. 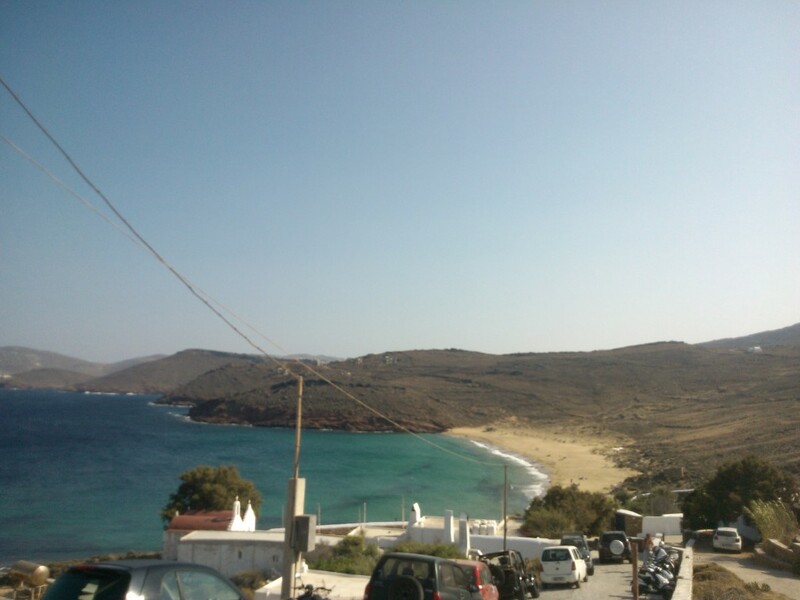 Some additional information regarding Psarou Beach and Nammos restaurant: Psarou Beach is 4kms from the main town of Mykonos, which is also called Mykonos town. If you go there by car, you will find it difficult to park, so be prepared to leave your car on the hill and walk downside for 300 meters. When you arrive at Psarou beach, you will find a great beach, with really blue waters, although quite cold during July. This place is the most protected place on the island from the winds. 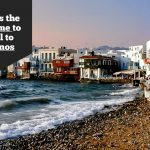 Mykonos is supposed to be the “island of the winds.” If winds start to blow, they may not stop for 3-4 days, so you will need to go to the beaches where you will not find yourself fighting with the sand all the time. Psarou beach and all the beaches on the south place of Mykonos are more protected from the wind. This is the reason that you will find a lot of impressive yachts in Psarou beach – except for the fact that their owners come to enjoy their luxury life at Nammos beach bar and restaurant. Psarou beach has three sections. The first part belongs to the Nammos restaurant and beach bar and is the most expensive one. The second part is in the middle of the beach and belongs to a cheap and unorganized snack bar, which is exactly the opposite of the posh Nammos restaurant. The third section belongs to the 5 Star hotel that lies on the beach. Below you can see the famous Nammos restaurant’s sunbeds – In the back of the photo, you can see the expensive “Riva” boat of the owner of Nammos, a boat that costs around 1.2 million Euros. He is using it to transfer the wealthy and famous from their yachts to the beach bar. The first section of Psarrou, which belongs to the Nammos restaurant, is the most expensive one. Here, a set of two sunbeds and an umbrella cost 60 Euros. Yes, you read well. 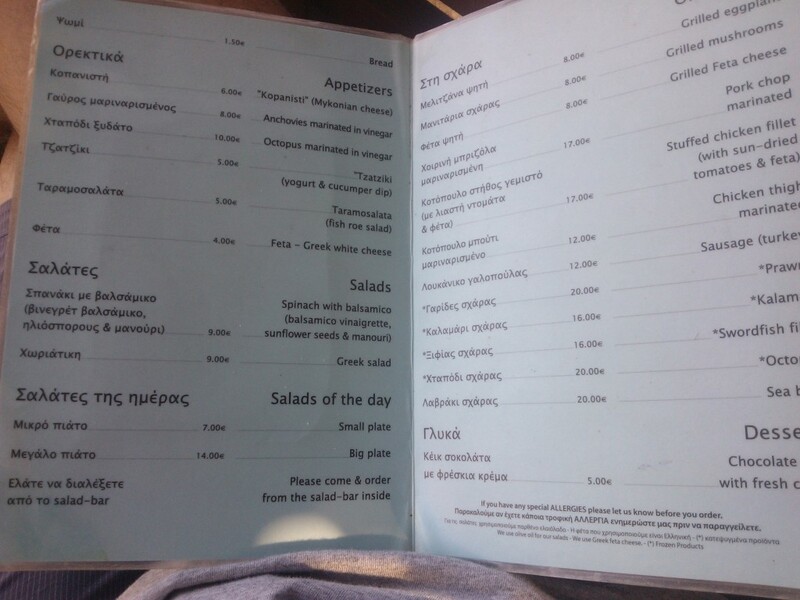 60 Euros just for the privilege of having a sunbed in Nammos restaurant. The same set of umbrellas to the little snack bar next to Nammos, costs 15 Euros, for the sake of comparison. And here is the view from the “cheap side” of Psarou beach. Yes, you are swimming in the same waters with your wealthy neighbors! 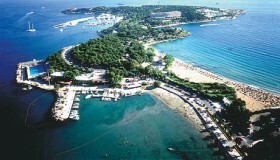 Below you can see the restaurant that belongs to Nammos and is situated on the beach. Here, expect to pay around 100E per person for lunch. Of course, the food is delicious. Do yourself a favor and book a Posh hotel of Mykonos even for one night. It’s a once in a lifetime experience, and we promise you will not regret it. You will meet top artists, fashion designers (e.g., Armani), have a dinner with fantastic views on the island of Mykonos and treat yourself like a king (or princess). – Stay at Cavo Tagoo. The most sought-after hotel in Mykonos, with Armani being a frequent visitor. Yes, we know..Expensive..Too expensive maybe.Bonus tip: Go to Google.com/news and write Cavo Tagoo. You will learn all the naughty stories of the rich&famous people having fun in this hotel. What we like about this place is that is posh and has fantastic views over Mykonos Town and the Aegean Sea, together with unparalleled service. What we don’t like, is that there is no beach in front of it, so you will have to travel to another place to swim (Agios Stefanos beach is 1.5 km from here). or stay at Mykonos Princess hotel at Agios Stefanos village, just a couple of km away from Mykonos town. Another great hotel is a new entry, which has become the talk of the town and is called “Rocabella”: Click Here to See the Rocabella Mykonos Hotel. It’s located at Agios Stefanos village, which is 2kms outside of Mykonos. And if it happens that you don’t have 500Euros/USD to spend per night to stay in these couples of hotels, (oh my god..going to Mykonos without a full pocket..), we hear you.Search here for hotels and make sure that you find one with great views and preferably in the town of Mykonos (Mykonos City), or at Agios Stefanos village which is 2km away. You can also try the hotel “Panorama” at Agios Stefanos (which offers pretty basic accommodation at a lower price, e.g., usually 80-100euros/night for a double room if you book early enough). Delos island is close to Mykonos, and it is a great archaeological island, while Rhenia Islands is an uninhabited island with crystal clear waters. The tour lasts 8 hours, costs around 90 euros per person and you can book it here. 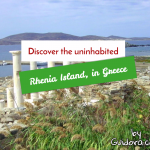 You can also book the same tour, without Delos, if you just prefer to swim in the perfect blue waters of Rhenia islands. 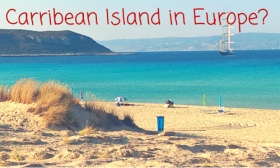 This trip takes 7 hours and costs 75 euros per person, while you can book it here. Have fun in Mykonos and please do let us know about any question you might have by posting your question below. You can also get our Mykonos in 3 Days Travel Guide here. Wonderful photos and views! 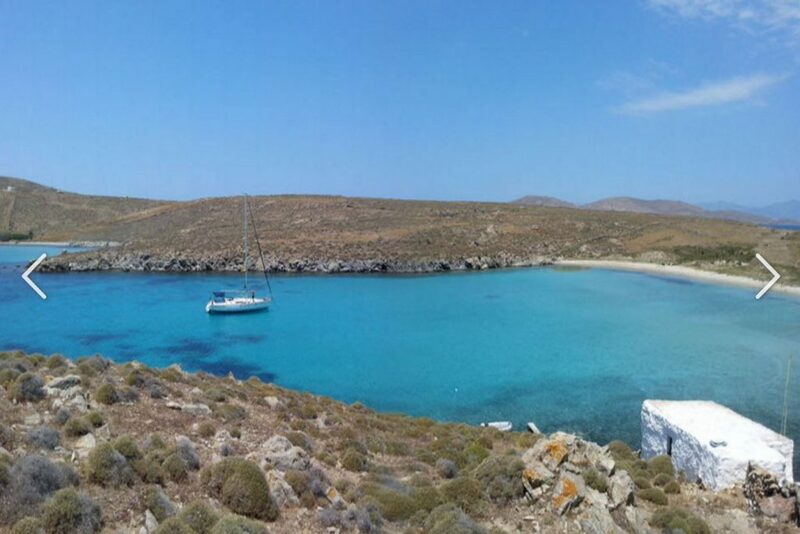 I can see why you would want to go Myconos. It looks like a wonderful mix of local events, clubs, and great restaurants. Everything is well said :). Please correct Myconos into Mykonos as it’s typical tourist mistake for this amazing island. 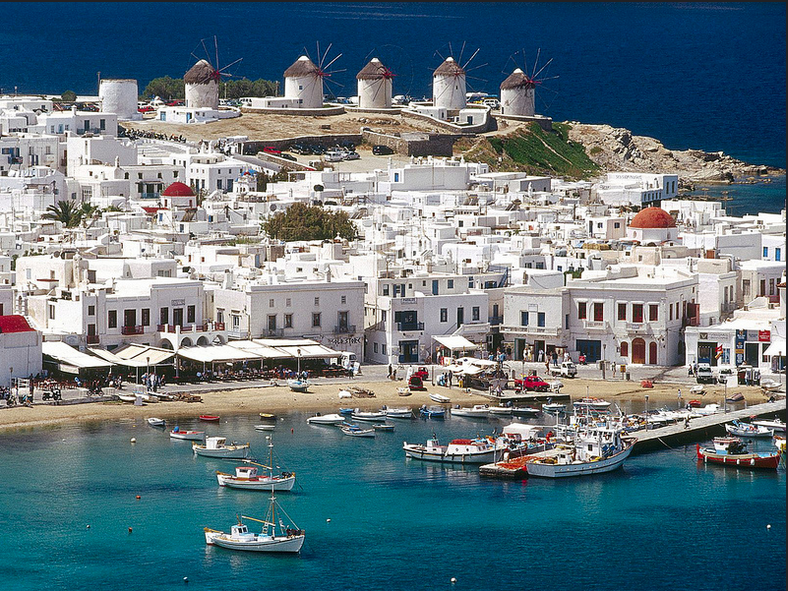 For those who haven’t been to Mykonos yet Mykonos is one of the most glamorous greek islands. Many famous persons have step foot on the island the last few years make it one of the most famous greek islands worldwide.